Hortus Camdenensis | Erica nudiflora L.
Half-hardy small shrub with hairy shoots, whorls of 3 leaves, and short terminal clusters of small, bright red or purplish-red flowers from the leaf axils. To 45cm. [RHSD, Don]. ‘A native of the Cape of Good Hope. We raised it from seeds about the year 1817. It is a low growing bushy growing plant, and produces its flowers in plenty during the autumn months.’ [LBC no.874/1824]. Introduced to Britain in 1810. [RHSD]. Only listed in the 1843 catalogue. Probably obtained from Loddiges’ nursery. 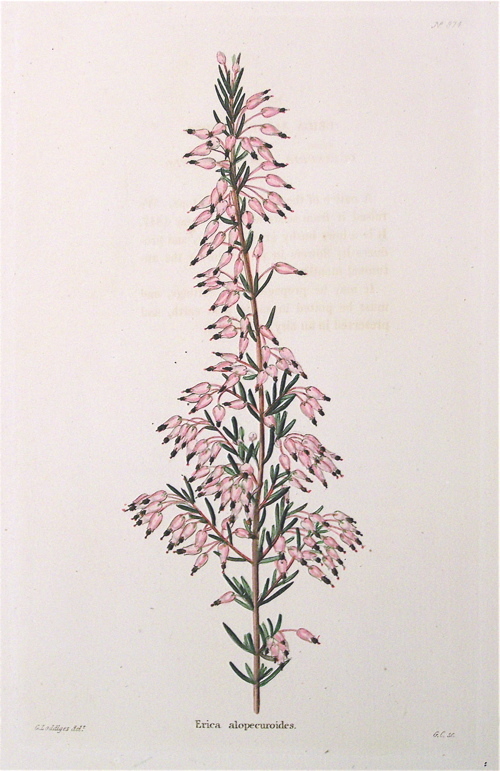 Loddiges’ 1830 catalogue listed about 300 species and varieties of Erica and the 1836 edition a similar number. 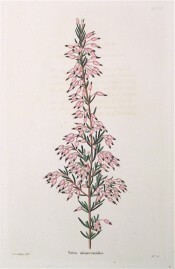 Erica alopecuroides is marked with a ‘c’ in the 1836 edition but not in the 1830 edition, suggesting it was obtained after 1830. [CPA]. It seems that Ericas did not thrive at Camden. Of all the species introduced by 1843 only Erica baccans was listed in the 1857 catalogue. Erica alopecuroides Wendl. = Erica intervallaris Salisb. More details about Erica nudiflora L.